The funding is a departure from the bank’s tendency to avoid financing exploration rather than fully-fledged projects because it is regarded as higher risk. Eric Rasmussen, director, natural resources at the EBRD, said the bank could make an exception because of “an exploration gap” following the commodity price crash of 2015-16. 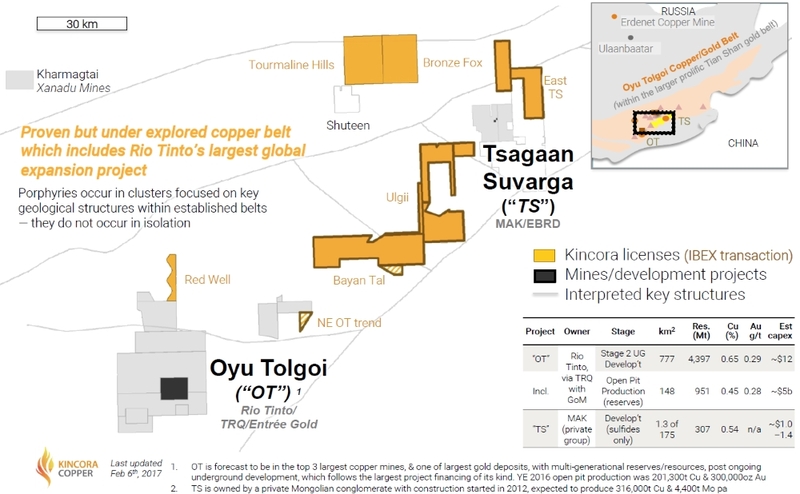 Kincora, which has acreage of more than 1,500 square kilometres in Mongolia, has begun drilling for copper, which is expected to be in high demand, especially in neighbouring China as infrastructure projects and an anticipated electric vehicle boom spur consumption. The company in August announced it had raised a separate tranche of funding of $5.92 million Canadian dollars. The EBRD is one of the leading institutional investors in Mongolia and has already helped to fund Rio Tinto’s massive underground extension at the Oyu Tolgoi copper mine. Since becoming involved in Mongolia in 2006, the EBRD has committed a total of 1.4 billion euros ($1.7 billion) to the Mongolian private sector through 86 projects. Although Mongolia has great mineral potential, investors have been wary because of percevied geopolitical risk. Its prime minister was ousted earlier this month and the country has had repeated changes of government since its transition to democracy in 1990.